Oh, back to school aisles... Each year they seem to spring out of nowhere and I always look forward to them with anticipation. What other time of year can you buy ridiculous amounts of craft and stationery supplies for next to nothing? Even with the endless shelves of goods, some years I've walked away empty handed (outside of the kids' supply list...) since nothing really grabs at me, or I've tried most of the stuff already. But this year I was picking up my first grader's crayons and glue sticks when I saw a pack of the PaperMate InkJoy gel pens on an end cap that caught my attention. I've used the InkJoy pens in the past in the retractable form, but these were in a capped variation which I found interesting. I, of course, bought a pack for...uh..."research" which made me realize that I don't do as many off-the-shelf product reviews as I once did. In the early years of my pen hobby I was trying new blister packs of pens almost every week, but not as much lately. But, I still use disposable, cheap pens super often out of convenience and need to give these over the counter options more of the spotlight. I'm not sure if the ink composition is any different when comparing the capped and retractable version (likely not), but maybe. One feature that the InkJoy gel pens tote is that they dry "up to 3x faster than the Pilot G2" which was also an interesting selling feature. One of the first things to note if you're new to the InkJoy pens is their very "stick" like design. The barrel of the pen is just a straight cylinder with no tapers, grooves, grips (some dimples though), or contours at all. The majority of the surface of the pen is a matte, grippy texture which makes holding it ok. Not that we're really looking for it in a disposable pen, but these aren't going to win any beauty contests either. Very simple; boring. Speaking to that point, there aren't very many disposable pens that have what I would consider an attractive appearance, outside of maybe the Uni-Ball Vision Elite. Actually, out of the top brands, Uni probably does it best. 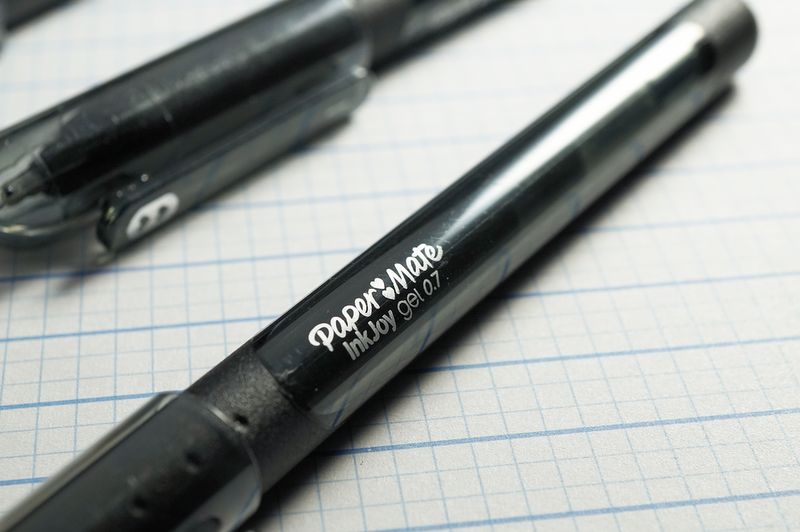 PaperMate has some staple pens for me like the Flair that I probably couldn't live without, but they aren't that good looking. Again, NOT a huge deal for a 50 cent pen. Where the InkJoy gel shines through though is in its writing experience as it is pretty top notch. The flow was awesome, it was extremely smooth (glided really...), and the lines were nice and dark. On the page it feels smoother than the G2 as well. Will it overtake my go-to gel pen, the Pentel Energel? I think not, but it is certainly a solid contender in the market. I've been impressed by the quality of the writing. Regarding the dry time claims, I decided to put it to the test against the G2 in 2, 5, 10, and 15 second intervals and I can say that the InkJoy came out on top. Hardly even a smudge with even the 2 second where there was still seemed to be some faint smearing at 10 seconds with the G2. In all honesty I can say that I really like this pen. Where I think it falls down a bit is in its presentation as it is a pretty uninteresting looking product and maybe a little on the "cute" side with the hearts from the logo, but it did catch MY attention. Touché PaperMate...touché. 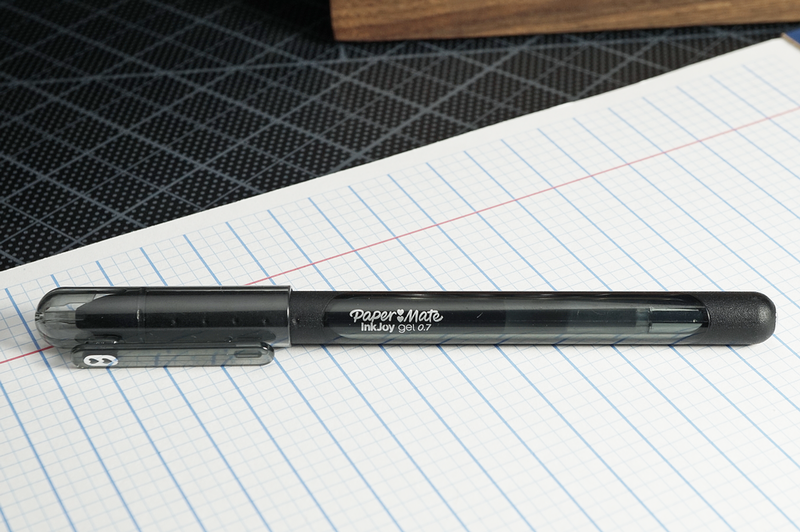 With people often having their "favorite pen" they may be set a bit in their ways, but if you're up for trying something new I'd say these might be a great option. I found my pack at Walmart in a somewhat obscure end cap, but they can also be had for pretty inexpensive from places like Amazon as well. Do you have a favorite gel pen?